Certainly one of the more sophisticated of window coverings. Usually all you need for a finished look. We carry several different brands and products. Whether you use real wood, vinyl, poly or newer composite materials, there are always reasons to choose one over the other. Price, application, durability...this is where experience addresses each of those needs. 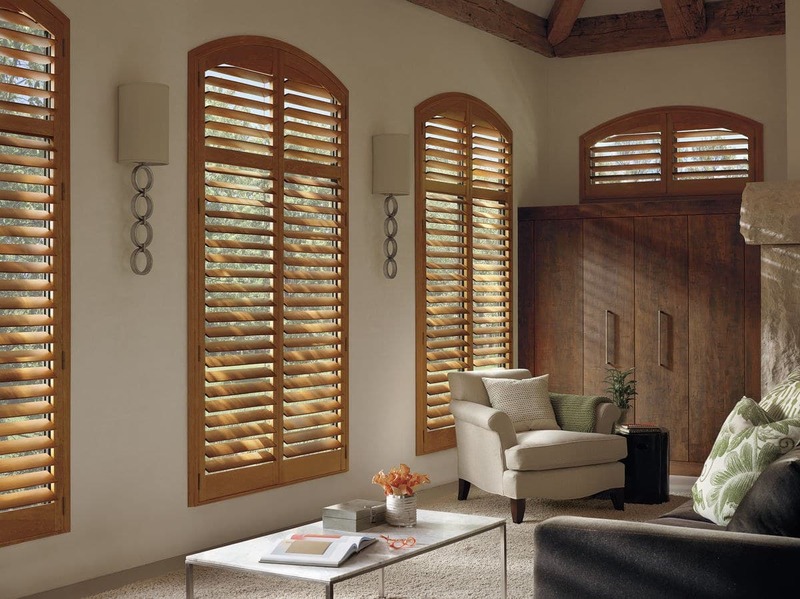 There are varying louver widths from 1 1/4" on up to 4 1/2". Variety of finishes and can fit almost any difficult shape or space. 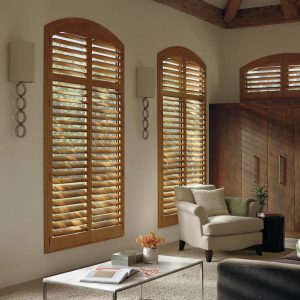 1 1/4" traditional louvers 2 1/2", 3 1/2" , 4 1/2" , 5 1/2" wide blade Specialty Shapes, French Doors, 20 Year Warranty. Constructed of premium hardwood featuring centuries–old craft tradition of dovetail joinery combined with an innovative multiple coat finish. A very well priced, high quality, imported, real wood shutter. Manufactured with all the best practices and components. Top quality, well priced Wood and composite. Polycore material of extreme durability with a baked-on waterborne paint. Both water and fire resistant. 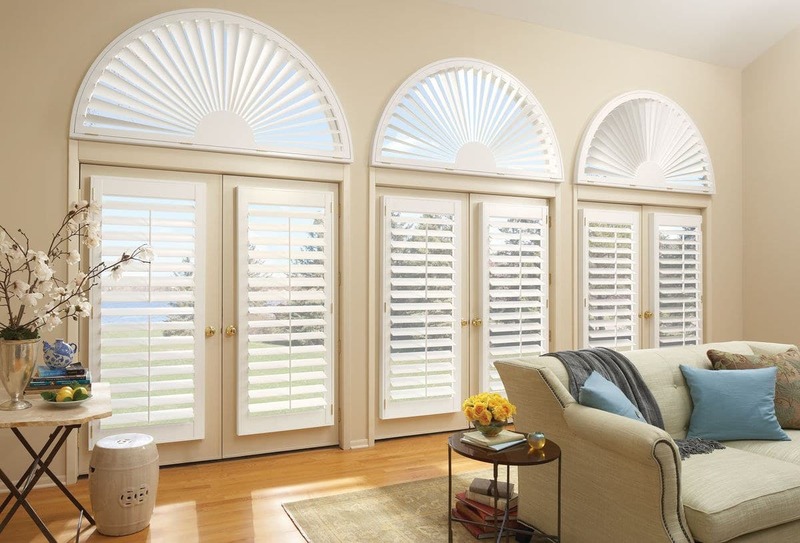 Hunter Douglas's "Palm Beach™" Plantation-style shutters constructed with UV resistant polysatin compound are guaranteed never to warp, fade, chip or peel regardless of high heat or other climate conditions. 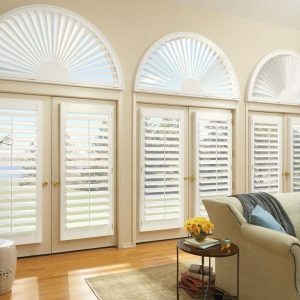 Lantana™ offered with Palm Beach™ polysatin shutters, is a patented gear-driven system for one-touch control and an unobstructed view. This system completely eliminates the traditional tilt bar. Polyclad skin with a real wood core. These too are extremely durable and the surface will not scratch, dent, fade, peel or discolor. The advantages of these panels is evident in wider applications such as bi-fold for sliding doors - means no tracks! Less expensive, more functional. Also available for French doors. Well priced for those on a budget. 3 colors. As with Hunter Douglas, a new product of extreme durability and function. Polycore shutters have a baked on waterborne paint, and are both fire retardant and moisture resistant, and can go outside. With it’s unique aluminum core structure it offers less weight, more strength and greater applications, yet still remains affordable. Learn more about our warranty and guarantee. Call us at 707-544-1906 or click here to send us a message. Have a question or want more information? Send us A message!